Last night it rained. While it was a light drizzle and therapeutic in the early evening, it got harder overnight and I woke up around 1 AM because it was too loud and I was too hot in my quilt. Thankfully without too much effort, and without losing too many articles of clothing I was able to fall back asleep relatively easily. 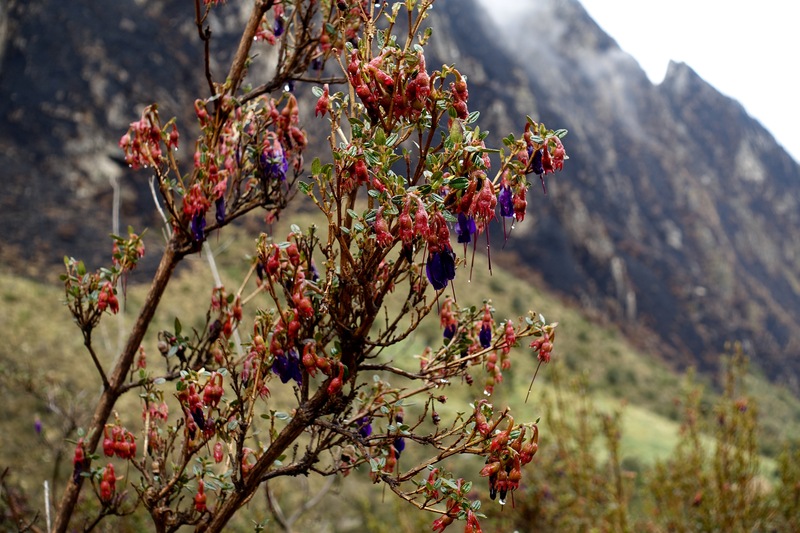 When dawn broke in the morning, the skies had cleared and we were greeted with bright skies when the porters woke us up at 6 AM with our morning Coca Tea. Tom and I quickly packed up our belongings, redistributed items to the Porter’s duffel, and headed out to meet our group for breakfast. After breakfast, we relaxed for awhile in order to allow the porters to pack everything up and then gatherered for the porters presentation. Freddy, our guide, congenially discussed the plight of the porters, the communities they came from, and how, despite the looks of it, being a porter was one of the better job opportunities available for rural communities located around the Sacred Valley. Did you know that each of them carries at least 25 Kg (55 lbs)? Holy Crap! One of them, Celio, was limping. Apparently he had tripped and fallen on his way down the mountain in the dark, but had still shown up for work. His face was also scratched up. However, despite his own pain and struggle, he was still in good spirits and kept shouting out Macháremos!, which means “Let’s Drink!” In Quechua. It was then time for us to shoulder our packs on and head out. For about 45 mins the stroll to Huayllabamba was much like the day before, soon after however, we began a gradual uphill climb to Ayapata that took about an hour. Ahead of us was the infamous Dead Woman’s Pass. Day 2 of the hike is said to be the most challenging, all of us knew it was coming, but we couldn’t help but be apprehensive about the struggles we would face. Thankfully it was split up into two parts. 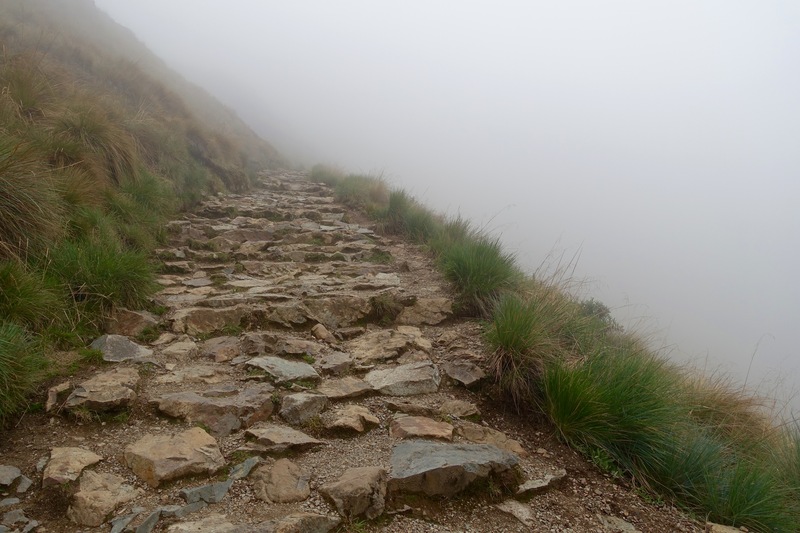 As our climb up the old Inca Stone steps became steeper, our pace became slower. I tended to be at the back of the pack because I had learned that I didn’t want to push myself too fast, and I’m not exactly the most steady-footed individual. 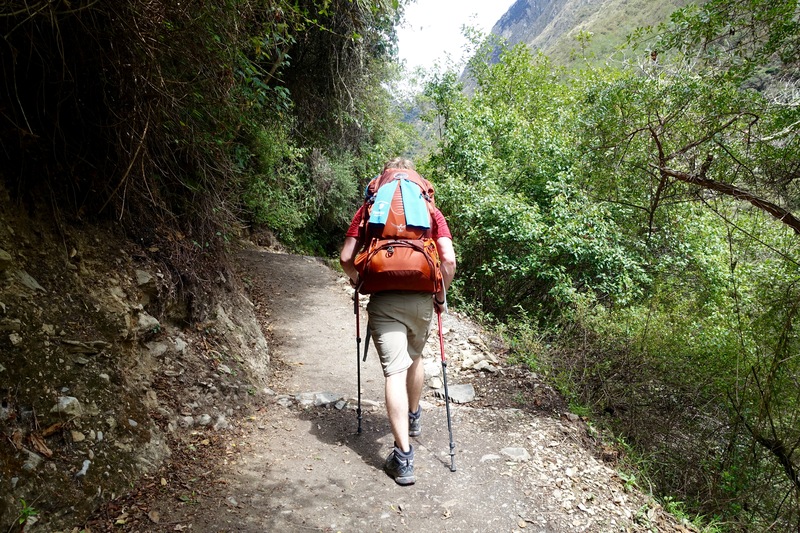 (Not to mention, that one of our trek-mates, Harry, had pushed himself the day before to keep up with his twin brother, and ended up feeling really lightheaded at last night’s dinner and needed to take a dose of oxygen including all the miscellaneous coca leaves and altitude medications we tossed his way). It was much wiser, and better, to take it slow and steady like the tortoise and pause for breathing breaks and water as needed. I gave myself plenty of time to enjoy the scenery and look around, while Tom forged on ahead. Seeing all the snow-capped peaks (incl. Apu Huayanay Mountain) around us was breathtaking! The views on the way up were spectacular, and I couldn’t stop myself from snapping pictures of flowers left and right. We also heard and saw some hummingbirds, but they flit around so fast it’s impossible to snap them! It was then time for Leg 2 of our ascent. The higher we climbed, the less sun we saw because we were literally climbing into a forest of clouds! The tree line fell away and we began to be surrounded by Polylepis Woodlands overflowing with grasslands speckled with small Andean bushes. 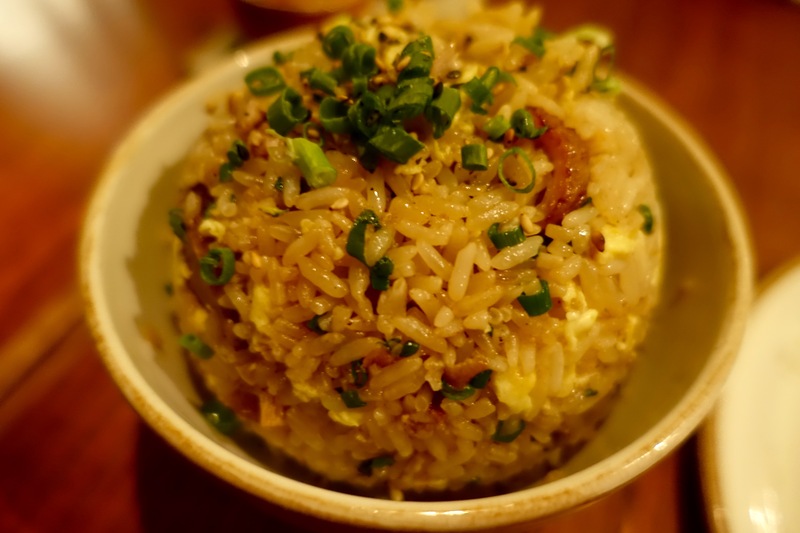 It also began to get colder, and more demanding on our cardiovascular systems, so the rate of our pauses increased. 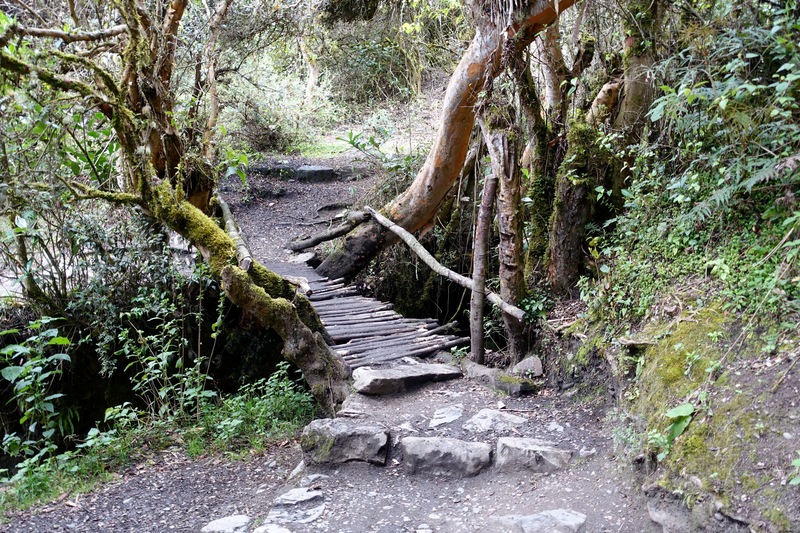 Since a large portion of the steps were reconstructed, they were deeper than the older Incan steps, and I found myself occasionally having to haul my body and pack up steps that were almost 2X the modern tread depth! I acquired a newfound appreciation for my hiking poles. After roughly 3 hours we reached the peak, the “belly” of Dead Woman’s Pass! 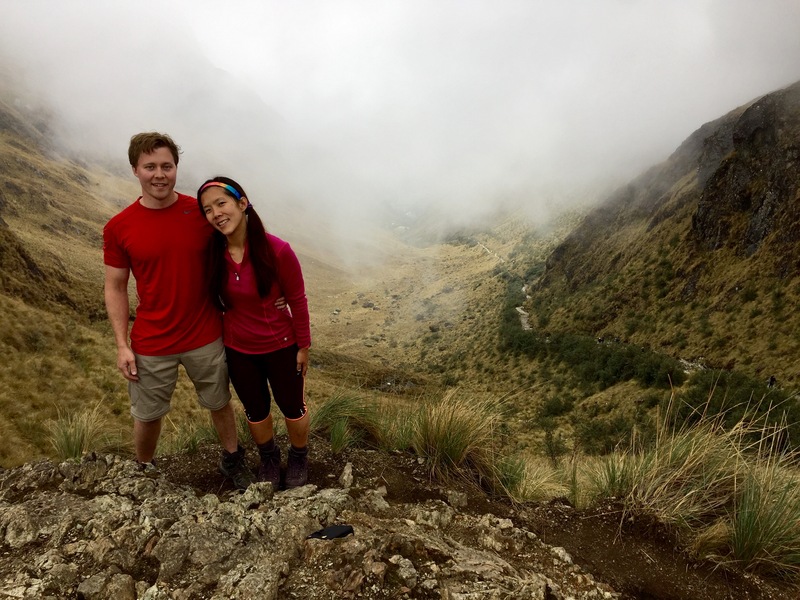 We had somehow managed to ascend 1,200 meters (~ 4,000 ft) within a span of 5-6 hours, and were standing at an elevation of 4,200 meters (~13,000 ft). 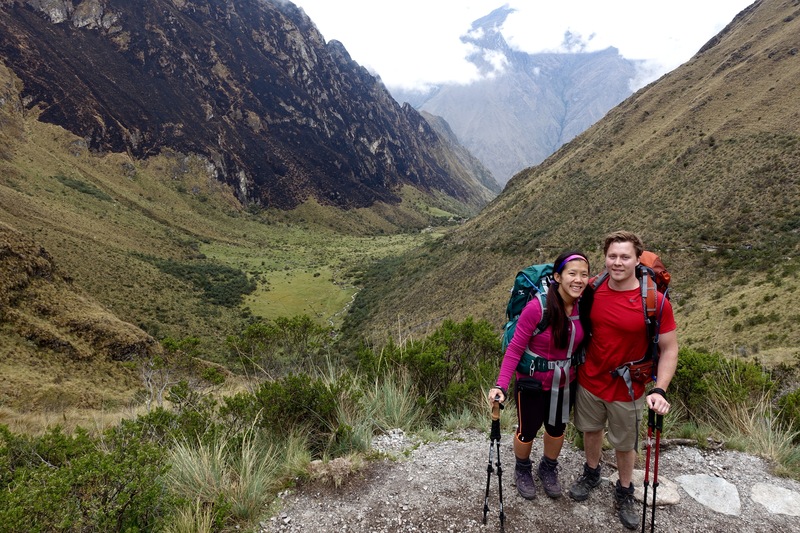 We were so thrilled with our accomplishment, and the tenacity with which we pushed through the climb. Unfortunately, since I was at the back of the pack the clouds had moved in just before I summitted so I was not able to enjoy the scenic view of the valleys below us. I enjoyed the descent into the Pacaymayo Valley significantly less, namely not at all. At that point my knees were starting to hurt, so I was going slower, and the combination of clouds and fog made visibility difficult. At one point I couldn’t see anyone in front of me or behind me and I was so scared that no one would be nearby if I slipped and fell. :(. When I finally found Tom I was obviously not happy with him. I had told him to forge on ahead on the uphill, but I felt that he should have known that the downhill would be my weakness. I wanted him by me for support and company, even if it required him to slow down his pace. After a burst of anger and tears, we continued on our way and made it to camp and settled down for the night. It took awhile for my steam to wear off…. Tom ended up having a splitting headache as well, and despite his generous dosage of pain medication, the guides made him take a few doses of oxygen as well. This morning I let Tom sleep in a bit while I worked to catch up on my blogging. Our hostel only gives us free breakfast until 10:30 AM, so when he didn’t show up by 10:10 I started worrying that he was still cocooned in bed. Just after I packed up my gear and got up to wake the sleepyhead, he emerged up the stairs. Pushing it a little close don’t you think babe? Whew! After a late start, our first stop was Qorikancha, which means gold enclosure (quri kancha) in Quechua. Quechua is an ancient Incan language that is still the most widely spoken language by the indigenous peoples of the Americas. 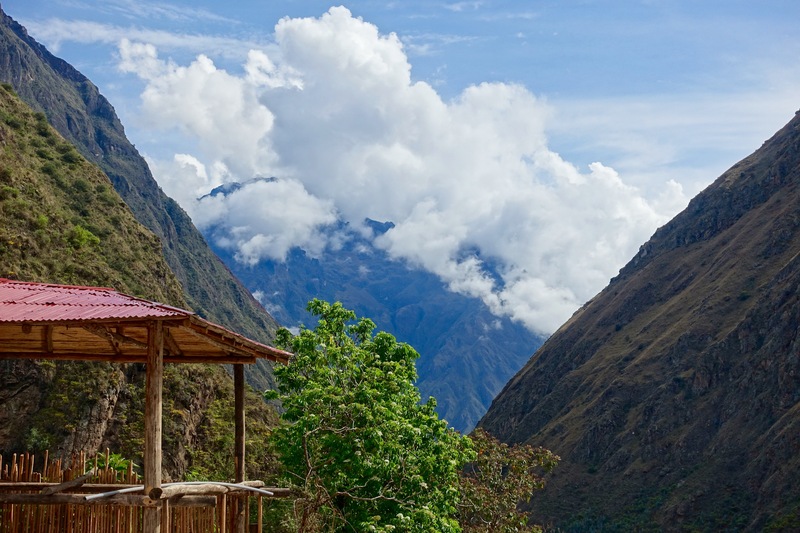 There are about 8-10 million speakers worldwide and 13% of Peruvians speak Quechua. While our guide the previous day mentioned that it is not a formally taught language in school, it is commonly used at home and parents teach their children who continue to keep the language alive with their children. 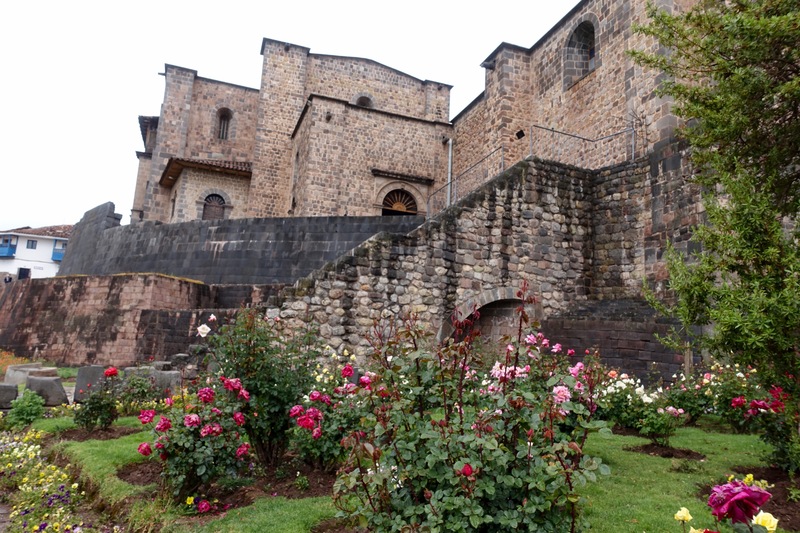 ﻿﻿On ﻿the foundations of the original Qorikancha now rests the Church of Santo Domingo as the Spanish conquistadores demolished the original Incan building to make way for, you guessed it, more Catholic structures. 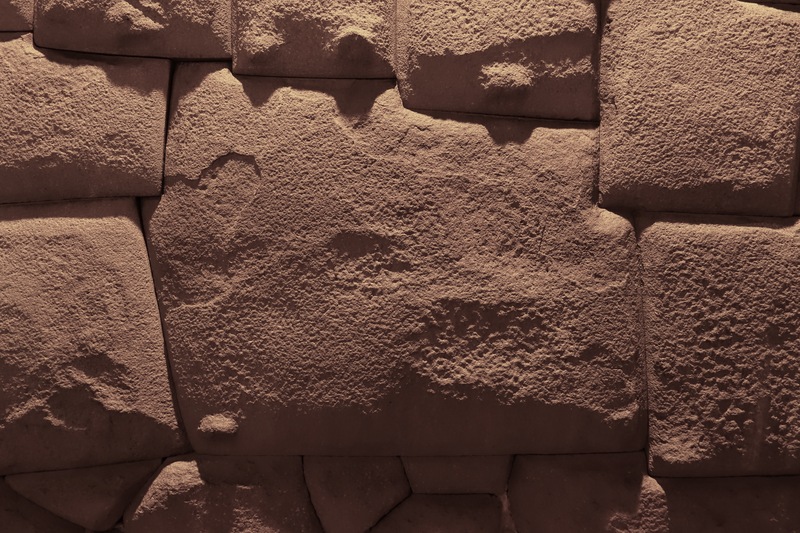 Interestingly enough some of the original Incan masonry remains intact inside, which allows you to see how artful and intricate their stone working skills were. The walls of the original temple of the sun were once covered in golden sheets, and the courtyard filled with statues. Unfortunately, the Incans themselves were forced to harvest from this richness when the Spanish demanded a gold ransom for the life of the 13th Incan emperor Atahualpa. 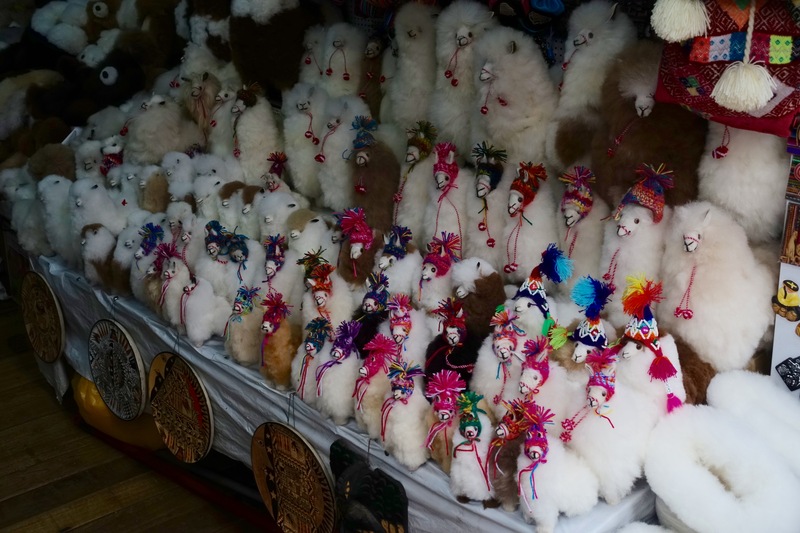 After leaving Qorikancha, we stopped by to visit the Centro de Textiles﻿ Tradicionales del Cusco (CTTC) right next door. 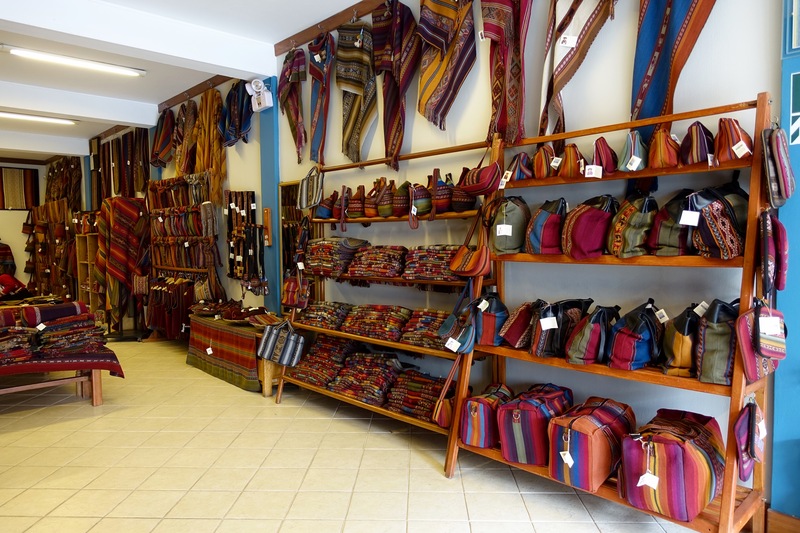 An organization established in 1996 by Andean weavers, it provides a free museum to the public to educate visitors on how the coat of an alpaca, lama, or sheep etc., is made into yarn and than transformed into a final product in the form of bags, clothing, and accessories. It’s main mission is to preserve cusuqueñan textile traditions and support the indigenous artisans. We then roamed through the local San Pedro Market before heading back to the Plaza de Armas to visit the Church of the Society of Jesus, once again a religious church (this time Jesuit) built on the remains of a former Incan temple. 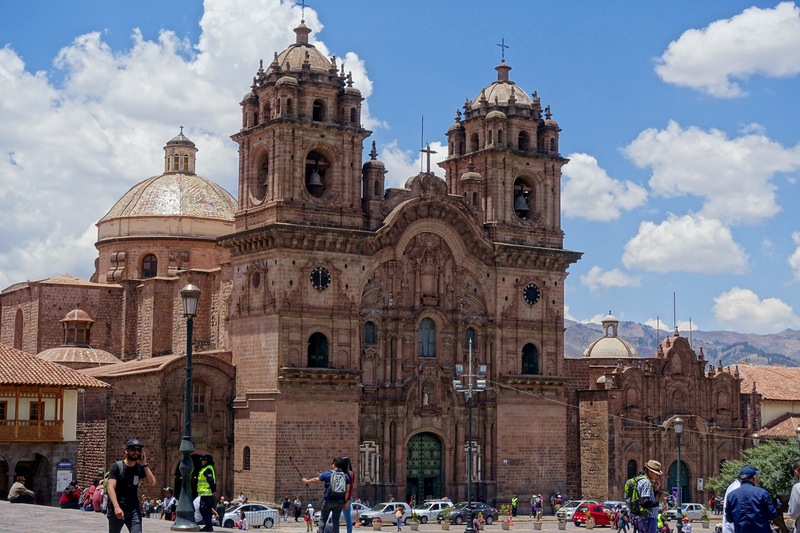 It is best known for a painting depicting the wedding of Martín García de Loyola, the nephew of Ignatius Loyola to Beatriz, the great-niece of the Inca ruler Tupac Amaru. (Tom was very grateful that no pictures were allowed). P.S. The Qorikancha had a fourteen angle stone! It was cut such that 3 sides of the stone served as the different faces of a door jamb.